Options for people with severe paralysis who have lost the ability to communicate orally are limited. 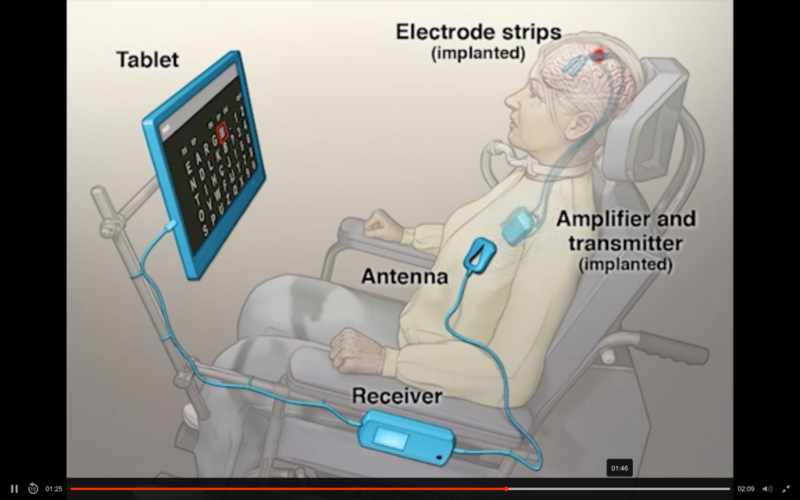 This article describes a method for communication in a patient with late-stage amyotrophic lateral sclerosis (ALS), involving a fully implanted brain–computer interface that consists of subdural electrodes placed over the motor cortex and a transmitter placed subcutaneously in the left side of the thorax. By attempting to move the hand on the side opposite the implanted electrodes, the patient accurately and independently controlled a computer typing program 28 weeks after electrode placement, at the equivalent of two letters per minute. The brain–computer interface offered autonomous communication that supplemented and at times supplanted the patient’s eye-tracking device.